Last week, Marine Corps Times outlined how the deaths of four Marines in Afghanistan in a one-month period were under investigation. It looks like an explanation may be emerging for how one of those deaths occurred. A Marine sniper was killed in combat Oct. 6 when a tank platoon mistook Lance Cpl. Benjamin Schmidt and other Marines for enemy forces, Schmidt’s father said he was informed. The story was reported by the San Antonio News-Express, which is based in Schmidt’s hometown. Although a military investigation has not been completed, Schmidt said the Marine, who is stateside, told him that Benjamin Schmidt died while his platoon was engaging the enemy in a firefight on a ridge in Afghanistan’s restive Helmand province. “What I’ve been told is that a tank platoon came upon them, mistook them for the bad guys and opened fire on the entire platoon. And that’s how Benjamin died,” he said. Schmidt was a member of 2nd Battalion, 4th Marines, which deployed from Camp Pendleton, Calif., to Helmand province’s Musa Qala district this fall. It’s not clear what kind of he may have been hit with. The M1A1 tanks deployed in the Musa Qala area alongside 2/4 are typically armed with a 120mm smoothbore cannon, a .50-caliber machine gun and two 7.62mm machine guns. It’s hard to believe that if Schmidt was hit with a cannon round, others in the platoon wouldn’t have been killed. In September, Maj. Gen. John Toolan, commander of Marine forces in Helmand, highlighted the success snipers were experiencing while working with tank platoons to target the insurgency in the Musa Qala area. The long-range sights on the tanks helped the snipers establish positive identification on enemy forces, the general said. Marines with 2/4 replaced 3rd Battalion, 2nd Marines, out of Camp Lejeune, N.C. in Musa Qala, and have been operating alongside Lejeune’s Alpha Company, 2nd Tank Battalion. It wasn’t clear they were involved in this incident, but they have remained deployed in that area. Praying for all involved. So tragic. My heart breaks for all those who have to deal with this, especially as they are sacrificing so much already to serve our country. How very sad. 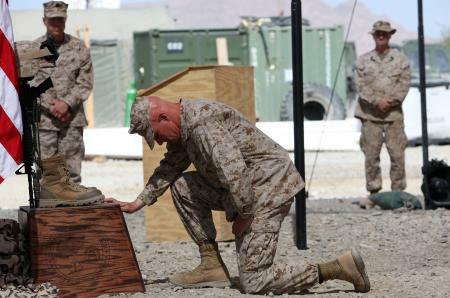 My prayers go out to LCPL Schmidts family, his Marine Corps brothers and to all members of the Magnificent Bastards. I know this article is a few days old but I wanted to comment anyway. Incidents like this are tragic. All the lost military lives are tragedies but cases like these are even more so. In most friendly fire cases there is no one to blame. Those tanks acted properly. If they hadn’t fired and those men had turned out to be the enemy one or more of those tanks and their operators (who are far more important than their vehicle) may have been lost. My prayers go out to the family of the fallen warrrior and also to the tank operators. Please forgive me if my comments are ignorant and/ or complete bull. I’m just a civilian college kid. But I do hope that my words impart at least a fraction of the enormous respect I hold for all of you in uniform.